The coach ladder: Who's pleasing the crowd? IT WOULD be a "dream come true" for delisted St Kilda forward Mav Weller to join his younger brother Lachie at Gold Coast as he hunts for a new club. 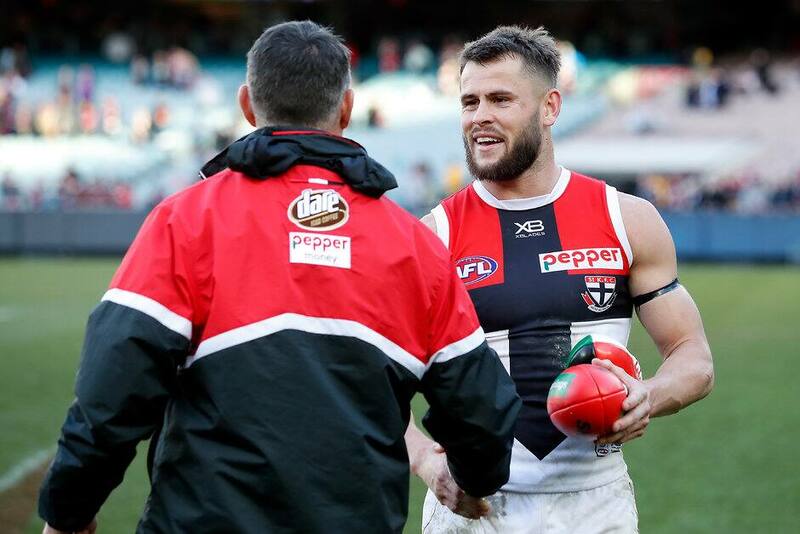 The 26-year-old was told last week he wouldn't be at the Saints in 2019. After starting his career at the Suns as a 17-year-old access selection, Weller is determined in his desire to keep playing AFL and would be thrilled to join his sibling. "I obviously would love to go play with my little brother. It would be a dream come true, but I totally understand where they're at," Weller told Melbourne radio station SEN.
"Obviously with the trade period, they're going into a bit of a rebuild phase, but I feel like I can add so much to a club like that in terms of my experiences and my leadership, and what I can do as a player as well with a younger group. "In saying that, I also feel like I could contribute so much to a contender and a club that's got established leadership." The first delisted free agency period opens on Thursday week. "My manager's talked to a lot of clubs, Gold Coast being one of them. It's pretty early days now," Weller said. Weller has played 121 games in his career. He had expected to earn a new deal, and had his first inkling that wouldn't happen only about a fortnight ago. "There was still a bit of indecision with contracts and stuff like that. I hadn't signed anything," Weller said. "They were going into trade period maybe thinking there might be a spot open up, I'm not sure. "It did come as a bit of a shock but that's the way it goes with list spots and restrictions on that sort of stuff. Sometimes you've got to make decisions. "I definitely don't hold any hard feelings."